There has been a lot of discussion around feeding and powering the population of 9 billion expected by 2050. Meeting this objective is highly complex and fraught with risk, especially when we consider that most of this population growth will be in emerging markets, primarily in the big cities. Do we have enough farmers to produce food? Will the food be produced where it is needed? Can the growing energy demand be met in a sustainable way? The prospect of sustaining the future population raises many questions, but what is certain is that meeting these future demands will require a fundamental change in the way we produce and consume food and energy. To increase productivity, farmers need to have access to production credits. Farmers in rural and developing areas specifically face constraints in terms of having the cash available to fund required purchases up-front that will only produce income later, once the crop can be sold. Farmers who don't have access to loans as collateral pledge away the potential payout of a crop insurance, thus facing debilitating difficulties if the growing season is unproductive or if adverse weather hits. Sustainable energy consumption can only be achieved by improving energy efficiency and switching to low-carbon options, including renewable energy sources. As investment in these new technologies increases, so will the demand for improved risk management and insurance. And in order to achieve global development goals for renewable energy, tens of billions of dollars are required. But funding isn't easily available, as the primary investors (private equity and utilities) don't have this much cash to pay for all of the new assets. Here, "de-risking" (through insurance) of planned assets can unlock debt investments from institutional investors such as pension funds and insurance companies. These players need to get involved in order to make the needed changes in the energy industry. What do you think? How can we best use the tools at hand to prepare for the massive population growth in developing cities? Tags: #Insurance industry, #Agriculture, #Urbanization, #population growth, #renewable energy, #Financing, #WEF13. Daniel - 1 Feb 2014, 4:54 p.m. So I'd like to take you up on your suggestion. 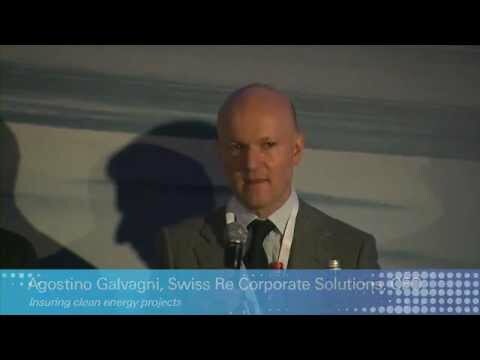 How can Swiss Re de-risk some of the renewable technologies I developed in order to provide capital to implement them. If you contact me directly, I can explain more of what I have in mind. By the way, I saw the interesting article about hurricane protection. That will take a while to test. But we can start right now by looking at the effect on tornados of all the wind farms going up in the midwest US. And my wave energy technology can do the same kind of thing for tsunamis, by the way. Juerg Trueb - 2 Feb 2014, 5:02 p.m.
Let me explain a bit more, Daniel. To finance projects, banks typically require a Debt Coverage Ratio (DCR, ratio between available and required cash for servicing debt) of about 1.2. Additionally they look at the projects' cash flow volatility and ask that for example in 95% of the cases the target DCR is reached or exceeded. For renewable energy projects cash flows are dependent on natural resources (e.g. no wind, no power production, no cash). Reducing this cash flow volatility is what we can do; in addition to covering the projects' construction and property risks. Please send your coordinates to juerg_trueb@swissre.com and I will call you. Ebrima Balajo - 17 Feb 2014, 4:44 p.m. I think there are enough farmers to produce sufficient food for the population. The food production is not done where it is most needed due to lack of efficient factors of production. Efficient factors of production, I mean high tech agricultural equipment. Productivity is a measure of output to input. Higher productivity can be a catalyst to development. I give you a typical example below.I have worked in the agricultural sector in the Gambia for six years and also in Switzerland for four consecutive summers (each summer five months).Gambia's partial factor productivity (PFP) which is the ratio of output to total harvested land area is equal to that of Switzerland's PFP. Depites, Swiss farmer's total productivity is far higher than Gambia farmer's total productivity. The difference lies in the labour productivity which is the ratio of output to total number of hours worked. Labour produtivity of one Swiss farmer can be equated to labour productivity of 50 Gambian farmers. This results to Swiss farmer's total productivity to be far higher than Gambian farmer's total productivity. This is simply due to technical evolution that Switzerland is experiencing and and Gambia not (technologically stagnant). A single Swiss farmer will own a minimum of two tractors plus all necessary equipment to operate the tractor while in Gambia, a tractor will be for a whole village (more than 100 farmers) with only a ploughing machine.I believe If the necessary and required equipments are made available to these farmers who are basically working manually, it will help a long way in producing sufficient food for the population. On one hand, this will create market for the technology developers and on the other hand enable production of food where it is most needed. Ebrima Balajo - 18 Feb 2014, 9:07 a.m. In addition to this, I believe many parts of Africa are capable of producing food all the year around by changing from rain to irrigation. During the rainy season, rain water can be used for cultivation and during the dry season, irrigation from river, lakes etc.The Gambia for example in the 1970s and 1980s barely imports rice (rice is the main food in most parts of Africa). In the rainy season, farmers use rain water and in the dry season, irrigation machines are used to pump water in the fields. There was continuous food production in the country.